"I began looking at my own culture for our magical stories..."
What was the inspiration for Besharet? 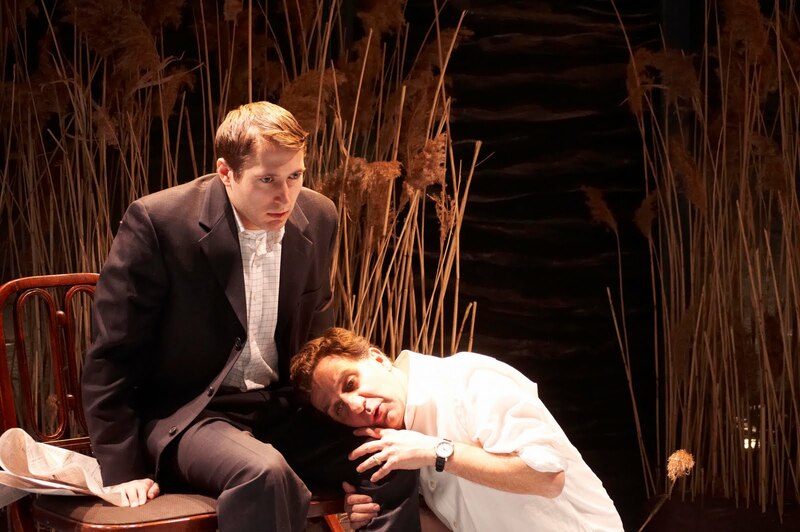 When I was around 19, I started writing plays and I dug around for what sparked me. I began reading lots of magical realism like Jose Rivera and Naomi Wallace (while learning about language from Suzan-Lori Parks.) I was obsessed with Marquez, The Master and the Margarita, Blood Wedding, etc. I began looking at my own culture for our magical stories - particularly the dybbuk and golem myths. Two manifestations of the soul, on opposite sides of the spectrum. 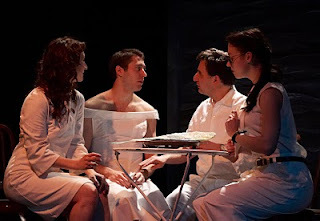 The dybbuk is a lost, searching soul stuck inside a living person. The golem is an empty vessel for other people's desires. I think this says so much about Judaism. Both myths are intersections of the public (the community) and the private. In turn, the community bears witness. It's a better kind of morality. It's not judgment and punishment; it's "now we all look at this together," or so I like to imagine it. How did you develop the play? I began this play almost 4 years ago! Some plays happen very fast. This play I feel like I've grown up writing. I had public readings for many of the drafts, over several years (which can be painful - a kind of forced birthing.) I toyed with it into a screenplay. When I met director Scott Rodrigue, I knew this was the person to bring my work to life. How did you and Scott work together? Scott is very good at asking questions. I write intuitively. I don't plan. I sit and breath and then I start typing. Scott, with our Dramaturge Rachel Ely, asked me questions. We sat and talked over many months about what might be going on. We drank coffee and tea and sometimes beer. It's a complicated world and it was very important that we explored all possibilities until I felt like we had arrived at the right place. Can you expand a little more on how your dramaturge, Rachel, worked with you? She's very generous and inquisitive and loves doing research. 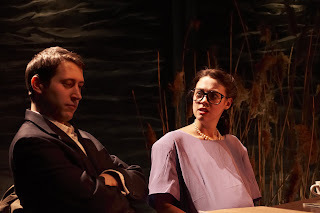 She made an incredible Wikipage for the play, with tons of information on it: about the 1980s, Women's Lib, Jewish mysticism, history of birth control, images from Noir films, the paintings of Marc Chagall (which heavily influenced this play.) The Wikipage was accessible to the cast and crew. One of our goals at AliveWire is to have everyone as collaborator-- designers, actors, everyone. Rachel was a very important link for making that community of artists possible. I loved the set design and music. How did you originally envision the set and did that change? Scott LOVES designers, god bless him. It's rare for a director to work so well with both actors and a design team, in my experience. He approached those meetings like the dramaturgy meetings with Rachel and me. They got together and drank coffee and asked each other questions. We make fun of Scott's #1 phrase, which is "What do you think is best?" I would of NEVER in a million years thought that the set of the play (the office, the lovely Cohen apartment) should be contained at the lake house. Eric's set design really cracked the play open for me. Of course they're all always at the lake house! They're haunted by the past; that's why they can't make a future. That's the power of great collaboration. Everything is elevated. How did you get involved with AliveWire? Scott and I met at a theater benefit two years ago. We drank a lot of wine. It became clear we were going to do work together. AliveWire grew out of our many little projects. Suddenly, you're doing the work, and you look around and say, Oh, I guess we need a name. And maybe a bank account? And business cards? Oh, and a website. The business part is still coming. AliveWire was born from necessity, which I love. You could say, our relationship stopped being casual. We had to get committed. I notice you have a few other projects going on that involve a feature length film and a graphic novel. Can you talk a little about those? Yes! Kevan Tucker, a lovely director (he did The Unidentified) and I are going to Worcester, MA this summer. We're going to film everyday and edit as we go-- it's an experiment in emergent storytelling, framed as a love song to the city of Worcester. A place dear to my heart. Delia Gable and I have been creating The Ruthie Chronicles, graphic novel about a woman in Queens at a crossroads. I'm writing and she's making exquisite drawings. I'm so LUCKY to know these people, let me tell you. I really love graphic novels, fantastical ones and intimate memoirs. I'm particularly inspired by Allison Bechdel, Phoebe Gloeckner, Erika Lopez. Comics are a fantastic medium. YOU CAN DO ANYTHING! I'm very excited about Ruthie. And going to comicons and possibly dressing up like Harry Potter. I try to not think as much as possible. Yoga is a fantastic practice for getting out of my head. It's important to get out of your mind and into your body. Authentic responses and gestures are so much more complicated and interesting than anything I could plan. Reading poetry or some open text, like a book about meditation, is also helpful in creating a quiet expansive mind-frame. I like to watch my boyfriend watering his plants. That helps too. You've taken workshops at the Einhorn School of Performing Arts and being part of their community. Can you talk a little bit about why you chose Espa and what you have gained from being involved there? Espa is how I met the lovely Rachel Ely! And lots of other great people. I've taken some great classes and workshops at ESPA-- my work has been most effected by Cusi Cram and a workshop from Constance Congdon. Marvelous, inspired women. What's exciting you right now about theater? Plays that seem impossible. Theaters popping up outside of Manhattan, in the other boroughs. Multi-Media creations! Do-it-with-others funding models. Last night, AliveWire had our reading series at PS122 with Craig Lucas directing a reading of my new play, Leap and the Net Will Appear, with Maria Dizzia as the lead. It's been a stunning, lovely afternoon. I feel like a lucky lady. More chances to work with generous, engaging people that I admire. I hope that's next. 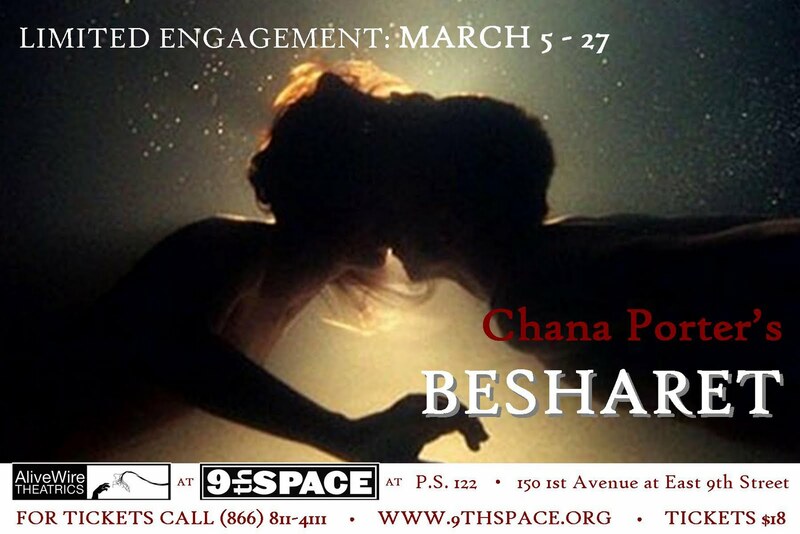 Chana Porter's play Besharet is playing a limited engagement at 9th Theatre Space at PS122: 150 1st Avenue at E. 9th Street through March 27th (Weds - Sun). Tickets are $18 and can be purchased here or call 212-352-3101. For more information about AliveWire go here. Chana Porter photo courtesy of David Gibbs/DARR Publicity. Besharet Photos by R. Perry Flowers.